The first poster released for "Mother of a Day," written, directed and produced by Hampton University Scripps Howard School of Journalism and Communications Assistant Professor Butch Maier. Lamont Ferguson, a standup comedian who lives in Portsmouth, stars as Ben Wilson – a good man who picks a bad time to forget a big holiday – in “Mother of a Day,” HU SHSJC Assistant Professor Butch Maier's second feature-length movie. 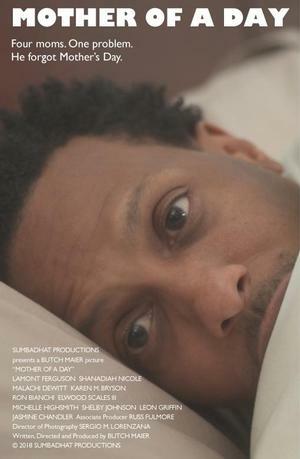 HAMPTON, Va. (July 5, 2018) - Hampton University Scripps Howard School of Journalism and Communications (SHSJC) Assistant Professor Butch Maier has released the first trailer for "Mother of a Day," his comedy movie about an African-American family. The trailer -- which can be seen on YouTube HERE -- features a recently retired member of the Hampton University family. Maier, who wrote, directed, produced and is editing the movie, included a clip of former SHSJC Assistant Dean Dr. Francis McDonald saying, "Here we go." With that, we are off on one wild ride following Ben Wilson (portrayed by Portsmouth standup comedian Lamont Ferguson), who forgets Mother's Day and has one hour -- with no money -- to find adequate gifts for the four moms in his life ... or face their wrath. Ben enlists his son (Malachi DeWitt) to cover for him while he races around town on a tiny girl's bicycle searching for presents to bring back for his wife (Shanadiah Nicole), daughter (Jasmine Chandler), mother (Michelle Highsmith) and mother-in-law (Karen M. Bryson). Along the way, Ben keeps running into two police officers (Ron Bianchi and Elwood Scales III) who deliver hilarious exchanges. SHSJC student Daryle-Kennedy Edwards acts in one scene in the movie, and fellow student Timia Whitsey served as a production assistant. "Mother of a Day" will premiere in select theaters in Virginia this fall before expanding to other states. 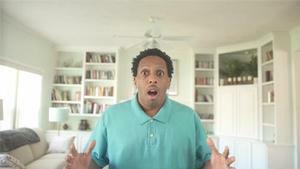 "I think there is a need for more positive movies about African-American families," Maier said. "I also think there is a need for clean family comedies you can feel comfortable inviting everyone from your family -- from kids to grandparents -- to go see. My hope is that churches and other organizations seeking positive, diverse content will hear about this project and choose to get behind it so they can be both entertained and edified." For more information about the movie, including group ticket inquiries, email Sumbadhat Productions at sumbadhat@gmail.com.